New York Retro Collection. 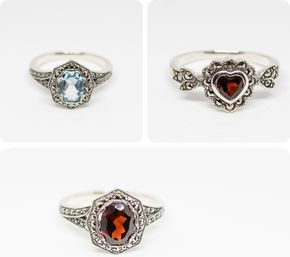 From New York a line of rings reproduced from designs made between 1860 - 1930. All are done in sterling silver with real gemstones, fresh water pearls and lots of marcasites. Flower Jewelry. These beautiful pieces are made in England using real miniature flowers that are grown in the Andes. The flowers are pressed in resin and set in sterling silver. The photos show our miniature roses, daisies, violets and forget-me-nots, poppies and mixed flowers. Spinner rings, also known as meditation rings are inspired by ancient Tibetan prayer wheels. 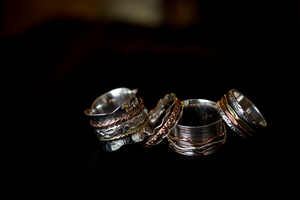 They are made from sterling silver, copper and brass. 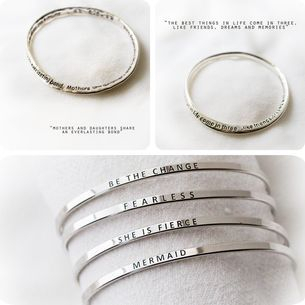 Pewter bracelets from Waterloo, ON have sayings that touch the heart. There are two kinds - endless message that wraps around the bracelet and the laser cut style with a simple message front and centre.